Toronto is infatuated with its bipolar summers and everything that comes with them -- including Canada’s Wonderland, home games at the Rogers Centre, and impromptu trips to Centre Island and Woodbine Beach. 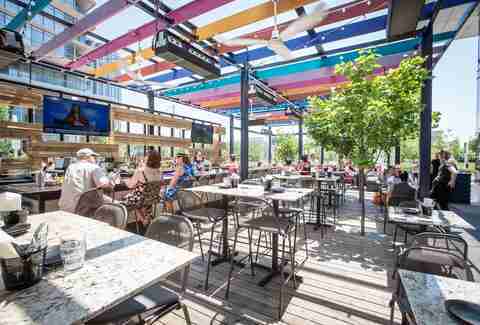 But once the heat waves kick in, the only thing that matters is #patioszn. 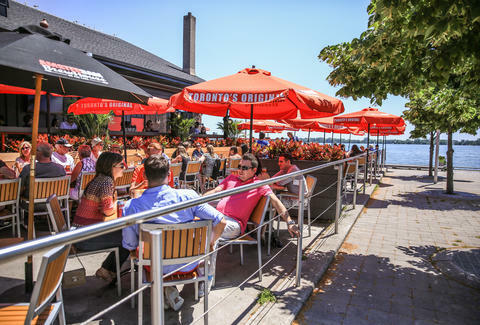 Drinking (and eating) outdoors is a great Canadian pastime. 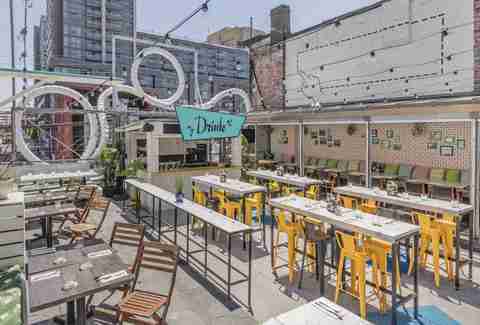 With summer finally hitting peak form, we're highlighting the city’s best patios and outdoor bars. Amsterdam Brewing’s lakeside HQ is renowned for its Muskoka chairs, umbrellas, and wooden 300-seat outdoor patio where you can recline and forget about the cottage. The BrewHouse has an extensive food menu that tackles apps, burgers, and in-house BBQ (think ribs and apple butter BBQ chicken) that's been smoked over aged Ontario cherry wood. And then there’s the beer. The bar is always stocked with Amsterdam brews -- Natural Blonde, Cruiser, Boneshaker IPA, and Raspberry Wheat. Buy a few bottles to-go from Amsterdam's own retail store. Paul Emery and Trish Welbourn’s "Blandsdowne" bar isn’t exactly a go-to for midsummer dates, but it should be. With an open-air roof, 3 Speed’s back patio's kitschy, Southern-comfort vibe pairs well with its craft brews, veggie omelettes, and weekend specials (mussels, brisket, and pork souvlaki). It’s fairly easy to confuse Brewco with its King West parent, so here are a few tips to keep things straight: the offshoot is the one that took over the two-story building on Peter St that was dedicated to nightclubs. 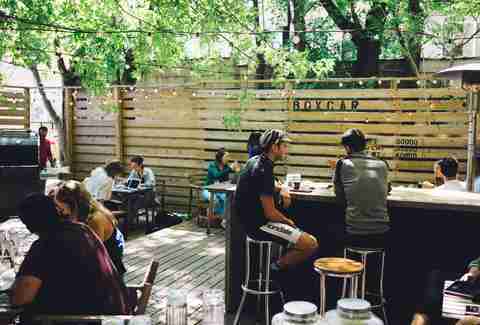 It’s packed with communal tables and 36 craft brews on tap. It offers up helpings of bone marrow poutine and mean farm greens. And on a cool summer night, the rooftop deck is the perfect spot for an ice-cold Goose Island Sofie or a glass of Bowmore 15. 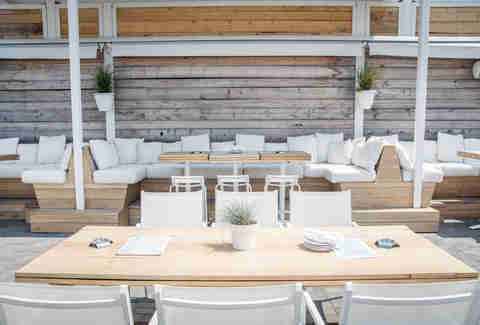 Grant van Gameren’s pintxo parlor has become one of Toronto’s trendiest quick-bite hangouts, in part thanks to its streetside patio -- perfect for lounging in the sun and after-work shenanigans. The botifarra ($12), chorizo ($7.25), and El Salvadorian pound cake ($4) are all maravilloso next to a glass of Pixie Blood ($16) -- a delightful mix of tequila, absinthe, and cinnamon grenadine that you should absolutely get. Polson Pier’s day-to-night party spot is basically a mini Ibiza with $24 fruit platters, but if you thoroughly enjoy Bud Light Apple and tan lines, then the Cabana’s for you. The pool haven is typically open during peak hours Thursday-Sunday, and if the slushie bar isn’t flowing, then you’re bound to run into Hed Kandi raves and DJ sets from the likes of Lil Jon and Tiesto. Clocktower Bar is the only reason you need to venture up to Summerhill this summer. 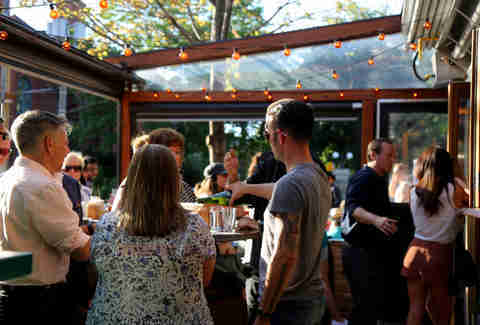 The Yonge St spot is a lot more than just Boxcar Social on bitters -- all signs point to its backyard BBQ-like patio, which has become an intimate checkpoint for fizzes, Old Fashioneds, and the Barcelona Address, a potent mix of Lustau Oloroso sherry, Cinzano, prosecco, and lemon oil. Done Right is a Trinity-Bellwoods gem mostly known for its dive bar charm. The Inn’s backyard patio is a wooden bench sanctuary that’s modest but perfect for post-park sunbathing, group shots, and cheap beer that isn’t too cheap. If you still aren’t convinced, it also accepts Canadian Tire money as a method of payment. El Catrin's outdoor patio is decked out with fire pits, lanterns, sugar skulls, massive chandeliers, and playful yellow furniture that cordially invites you to test out the tequila bar, stocked with over 120 different labels. In other words, pick your poison with a side of the modern-meets-traditional Mexican fare. The Oaxaca-themed mezcal bar is another outpost from Grant van Gameren, and much like his other setups, it’s giving the neighborhood a modern bohemian look. If you don’t believe us, then believe in El Rey’s front patio, which has become a home for picnic tables, tropical flora, and 30-plus batches of mezcal -- including rich arruqueño and tepeztate. There are also botanas such as morita popcorn, roasted plantain, grilled lamb hearts, and chapulines (grasshoppers). Hemingway’s is a GTA throwback that's been keeping Yorkville cool for years. 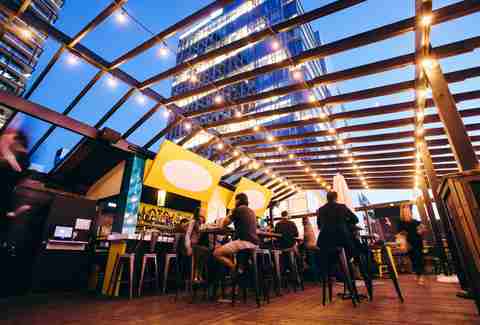 The New Zealand-inspired restaurant provides the calamari, jerk chicken burritos, import brews, futbol games, and a massive, covered, pub-casual rooftop patio that has your back year-round. Kasa Moto is a Japanese restaurant that focuses on chic seafood dining, but don’t be fooled by its minimalist heart. 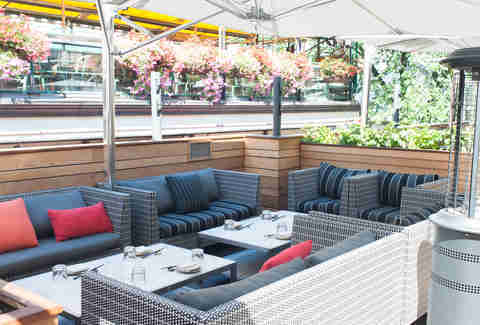 The Yorkville establishment features celestial sushi plates, protein-heavy noodle dishes, a vast cocktail list, and a heated rooftop patio that has its own dedicated bar and cabanas, which can tend up to 180 people on a busy night. Looking to reinvigorate the brunch dating scene? Embrace Le Sélect. 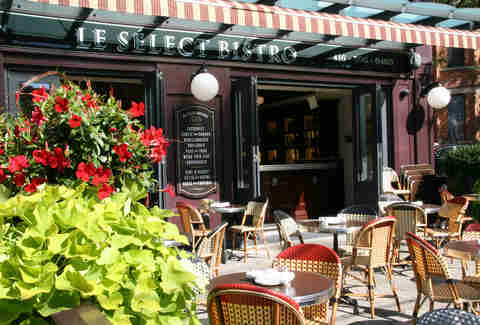 Its front patio and private terrasse are a hot commodity on the weekends -- the Parisian ambience is accentuated by steak frites, Fogo Island crab ravioli, fresh croissants, and a wine list that will fulfill your inner Francophile’s every need. Just be warned: the mood switches come nightfall as the glasses of pinot noir and Sancerre turn the spaces into illustrations of 19th-century French Romanticism. CityPlace’s new Tex-Mex joint is fortified with eclectic apps from chef Guillermo Herbertson -- think house wings, mini tostadas, and corn quinoa fritters -- but here, the 100-seat patio is king. The enclosed space faces Canoe Landing Park and is connected to a wall of arcade classics (Pac-Man, Street Fighter). 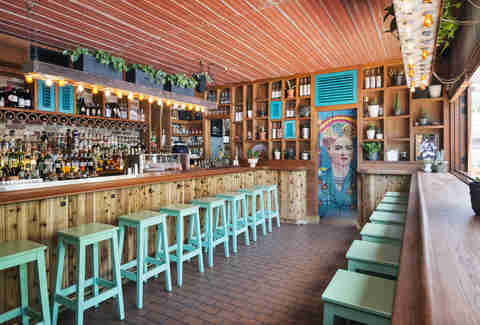 The beverages are also really hard to top, as Macho’s drink list is loaded with cocktails ($8-$10), margaritas ($8-$20), sangria ($25), and agua frescas ($8) that will either bite back (hibiscus + gin) or tingle your senses (mango + Olmeca Altos Plata tequila). 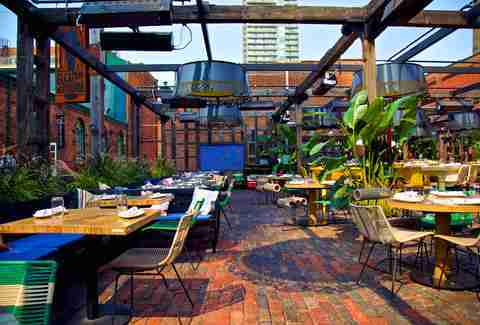 Toronto has its fair share of rooftop patios (Mascot Brewery, Harvest Kitchen), but The Porch is a casual spot that welcomes all types, including office cliques, Tinder dates, and Pokémon Go experts. 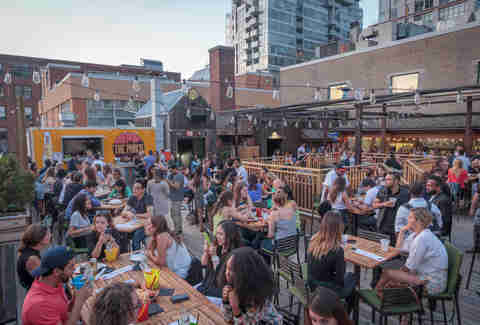 The always-bustling deck is above Adelaide’s Rock ‘n’ Horse Saloon, making it a place for quick Snapchats with the CN Tower and doubling up on Selfie Sweet Tea ($8.75) and lime margaritas ($14.75). If all else fails, at least there’s the Pizzadilla Rolls ($17). Ask any Queen West aficionado: The Drake will always be there for you. The hotel has become a year-round retreat for all things music and trivia, and for this summer, Sky Yard has become a Palm Springs-esque hang that throws it back with vintage photographs and a retro diving board. The rooftop deck is also outfitted with nippy cocktails, brunch snacks, and modern art pieces such as Micah Lexier’s "Finger Drawing" and INSA’s GIF-iti mural, "I Would Die 4 U," which honors the late, great Prince. Joshua Khan is a Toronto-based writer who is 100% guilty of ordering an alcoholic beverage (or two) before noon. Follow him and his endeavors over at: @blaremag.